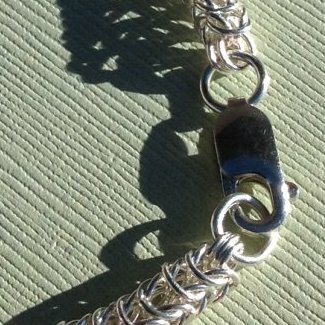 The mermaid/dragonscale cuff bracelet is simply stunning – slinky and sparkling with 100s of woven sterling silver rings in an overlapping pattern of inside and outside rings. Fine Jewelry. This is a unisex bracelet, neither “girly” nor “macho”. The wide cuff design will work for both men and women. First, it’s unique. 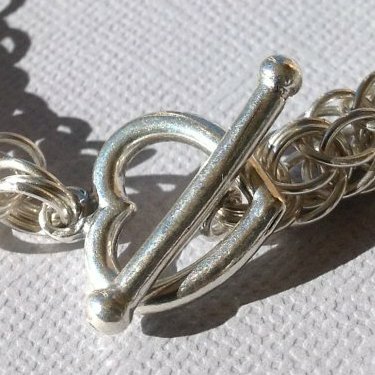 The dragonscale (for men) / mermaid (for women) design is a truly advanced chainmaille weave. Smaller inside rings are woven to face in one direction, while larger outer rings are woven to face in the opposite direction. The result looks a bit like scales with the overlapping rings. This gives it an appearance of depth and weight, without making it overly heavy. Also, with inside and outside rings, this has A LOT of rings per inch. 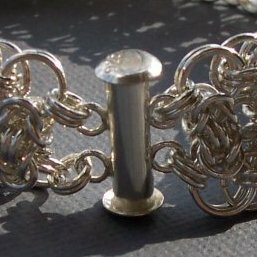 This design takes longer to make than any other chainmaille weave. The bracelet in the photos took around 18 – 19 hours to make, not including making the rings and polishing. I wear one of these bracelets once in while (when I’m not wearing my Full Persian bracelet.) It feels very nice. It’s heavier than most bracelets, so you won’t forget you’re wearing it.